November 19 â€“ November 25. Our approach to Miami. 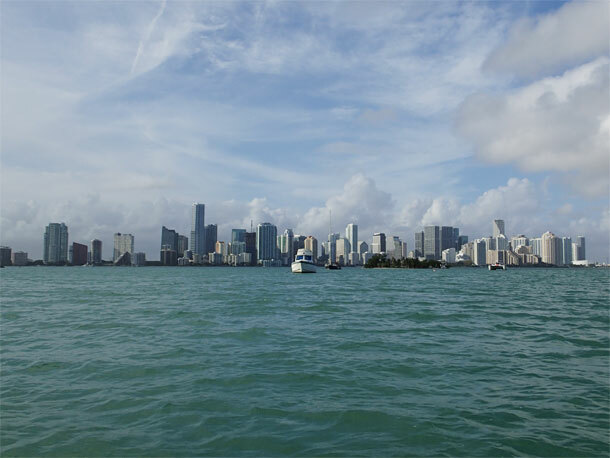 From the water it looks like Miami stretches all the way up the coast to Fort Lauderdale. Woo Hoo! Weâ€™re underway. Itâ€™s November 19th. We asked to raise the Roosevelt drawbridge at sunup. We motored out the St. Lucie inlet. And weâ€™re now sailing south in the Atlantic Ocean. Stuart and the Sunset Bay marina are wonderful places. People choose to live there all year. But two months in one spot is too long for us any more. All systems are working fine out here. Weâ€™ve got plenty of sun and just enough wind. Back at the marina it clouds up by 3:00 every afternoon, and there hasnâ€™t been much wind. Weâ€™ve had to run the engine two hours a day to charge the batteries. Even thatâ€™s not enough. And our battery dedicated to starting is getting weak. 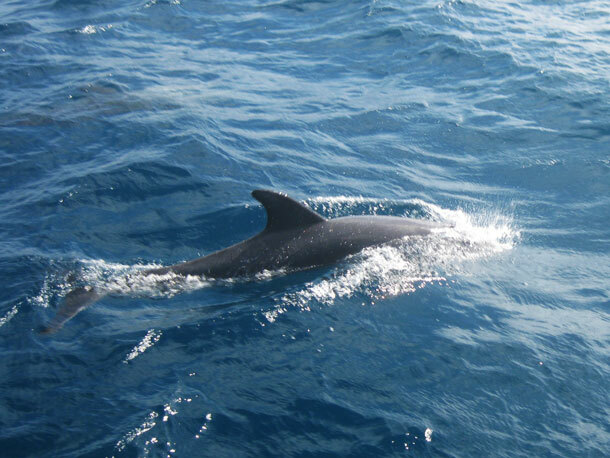 This dolphin accompanied us part of the way to Lake Worth. We pass the state park near Hobe Sound. We pass the Jupiter lighthouse. We pass the high rises of North Palm Beach. Then there are the markers for the Lake Worth inlet. We drop sails, motor through the familiar cut, and anchor in our usual spot by 4:30. We have delicious tempeh tacos for supper. Life is good. Weâ€™ll rest tomorrow, set the alarm for midnight, then sail to Miami. Nov 20. The engine wonâ€™t start. We let the solar panels charge the house batteries. I heat the glow plugs with a lighter (instead of draining more power), and use the house batteries to crank her up. It rains at night. We decide to postpone going to Miami. Nov 21. Steady rain all day. Weâ€™ve determined that the starter battery wonâ€™t hold a charge. We call around to find one. West Marine in North Palm Beach has what we want. 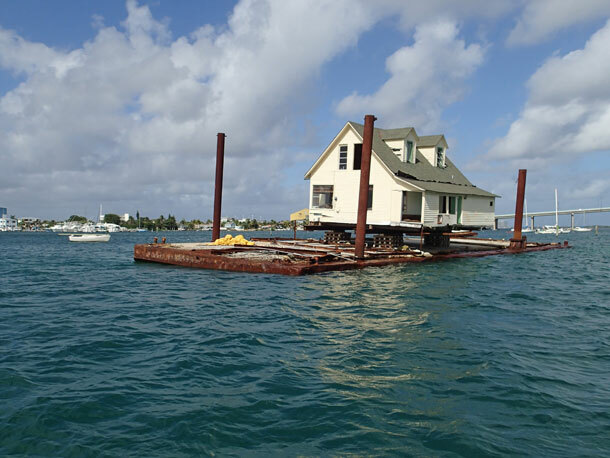 House Boat? Seen on the way to North Lake Worth, north of Peanut Island. Nov 22. The rain clears. We start the engine with the usual contortions and motor up to North Lake Worth in North Palm Beach. We dink in and swap batteries at West Marine. The old one has less than two years on it so the new one just costs $46. We stop by Publix on the way back to the boat. The new battery cranks first try. When we decided we needed the new battery we weren’t really sure where we could dink to shore. 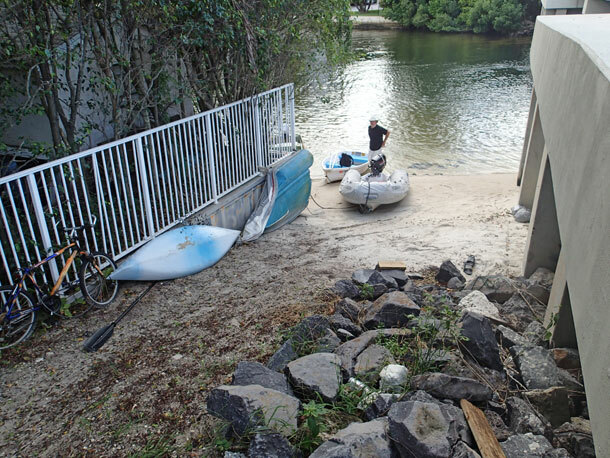 After a search on the internet we discovered that there was an unofficial dinghy landing next to a bridge in North Lake Worth. People appear to live full time in this part of the lake. The live aboards not only land their dinghys in this spot, but keep bikes and other means of land travel locked up here. The anchorage at North Lake Worth. You can see the high rises of Singer Island in the background. Nov 23. We motor back to our usual Lake Worth spot near the inlet. We rest up and set the alarm for a midnight departure to Miami. Nov 24. Wow, thatâ€™s cold. Itâ€™s 4am and weâ€™ve been motoring four hours because thereâ€™s no wind. Just now a steady slow breeze started from the west. Itâ€™s much cooler than what we had. By 8:00am we have enough wind to sail. Itâ€™s shifting northward. 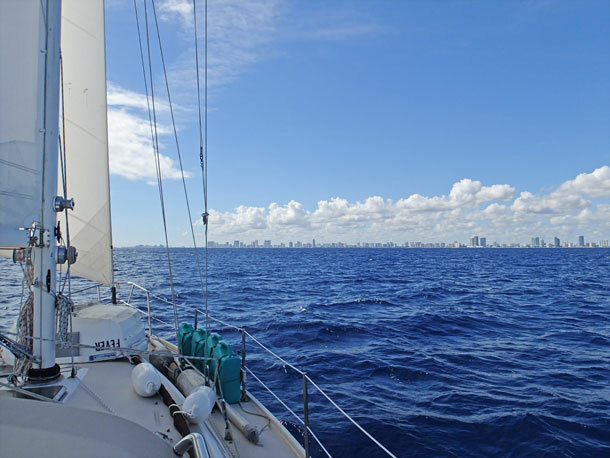 We make it as far as Ft. Lauderdale before we have to start jibing to stay on course. By the time we get to Miami itâ€™s a steady northern flow of over 15 knots. Government Cut into Miami goes east/west so the boat lurches from side to side as we go in. Once we are between the stone levees the waves calm down. The Sunday afternoon joy riders and jet skis race up and down through the cut. Miami from our anchorage at Marine Stadium. Well. It took a while, but we are in Miami, positioned to cross to the Bahamas when the conditions look right. The battery thing slowed us down, but Iâ€™m glad we worked it out here. It would have cost over $200 in the Bahamas. And it was nice to sail down through the Atlantic instead of creeping down the Intracoastal Waterway, waiting for drawbridges to open. 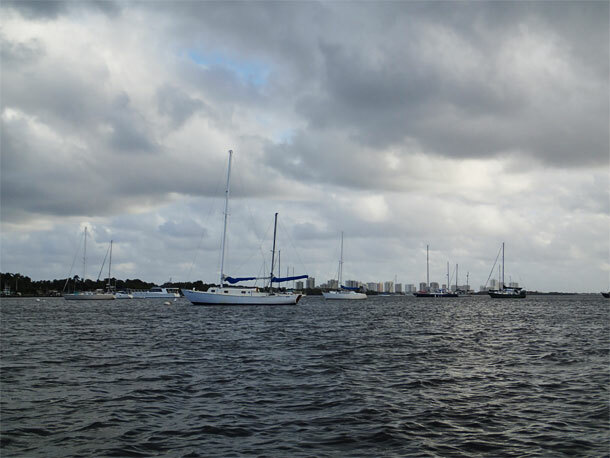 This entry was posted in Lake Worth, Life on the Water, Miami. Bookmark the permalink. Let the journey begin! We’ll be thinking about you back in c-town.